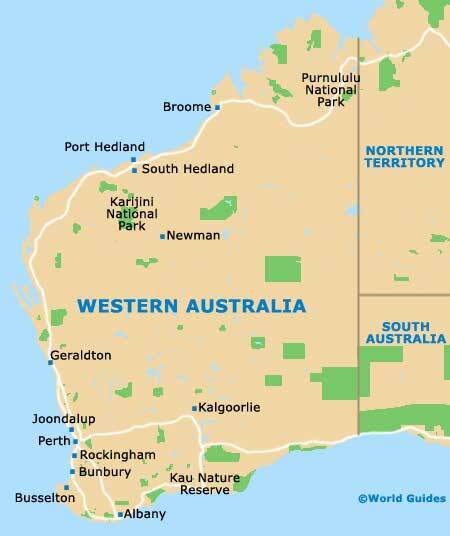 Western Australia actually takes up the whole of the western part of Australia. Take a look at any map and it is easy to see the impressive and immense proportions of the place. Despite its size, though, not that many people live here and those who do tend to hang around together, in the extreme south-west of the state. The north of Western Australia is a land of white beaches and waterfalls, stunning views and national parks, and a myriad of interesting towns worth a visit. This is also the home of arguably the most famous diamond mine in the world. In fact, more diamonds are mined in Argyle than anywhere else in the world. Most tourists head straight for the south-west of the state, with its glorious beaches, abundance of greenery and exotic wildlife, including an impressive list of bird species. Hang out on one of its beaches for long enough and you will catch a glimpse of a bottlenose dolphin or even a whale. The oldest European settlement in Western Australia is Albany, a city that is partly glamorous in an old-style way, and partly modern and trendy. The city of Perth took a while to find its feet, but today is a quite sophisticated and worthy winner of tourist attention with its easy-going attitude and modest cosmopolitanism. If laid-back living is your thing, then Fremantle - much loved by artists and writers alike, manages to outdo all other Western Australian cities. In between north and south, there is desert, desert and yet more desert. With parts of it still in an almost pristine state, if ever there was a place that could be called a final frontier of earth, this semi-arid stretch of Western Australia has to be it.